In the women's Premier League Storms, who lost 41-60 to Strathmore University Swords at the weekend, will meet coach Ever line Kedogo's Eagle Wings in a match that could go either way. Eagle Wings, fresh from beating Kenyatta University Oryx 65-51, will rely on their dependable scorers Winnie Wafula and Mshilla Rose for points. Storms again play hosts USIU-A Storms today at 1.30pm. Pressure will be on Storms shooting star Steffie Ngabire and veteran Angela Luchivya as the team seeks to avoid dropping points in the first leg. Coach Justus Akwhesa's Tangit Sparks, formerly Masaku Sparks, will have a tall order as they take on newly-promoted Africa Nazarene University. Tangit Sparks narrowly lost 46-44 to University of Nairobi Dynamites in their last match and are expected to come out fighting in search of their first win in four outings. In Nakuru, hosts Egerton University men and women's teams will host Nairobi-based fellow Riara University students in the men's Division One matches starting at 9am. Nakuru Club, who are regular campaigners will play host to Zetech University popularly known as 'Titans". On Sunday, Thunder, who garnered maximum four points after ending Ulinzi Warriors unbeaten run, will face newcomers Emyba at Nyayo National Stadium Gymnasium from 4.30pm. Equity Bank men and women's teams will return to the same venue to meet their opponents Tangit Sparks and USIU-A Tigers respectively. Equity Bank men's side demolished Umoja 58-44 while their women counter parks, who are the reigning champions, whitewashed Kenyatta University Oryx 69-33 last weekend. In Kakamega, hosts Western Delight tackle newly promoted University of Nairobi's Dynamites in the women's Premier League while Nebulas have a date with Little Prince in the men's lower tier first leg match. Blades, who had no engagement last weekend, will bhost Kisumu-based Lakeside with Footprints locking horns with impressive Strathmore University Sword in their women's Premier League showdown. 28-year old center Joyce Nabwire (185-90) left Equity Bank (Premier League). Nabwire played there also last season. But in 5 African Champions Cup games she averaged just 1.6ppg and 3.4rpg. 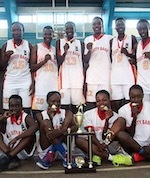 She won Kenyan Premier League championship title. Nabwire is a very experienced player. Equity Bank (Premier League) tabbed Melissa Akinyi. She played recently at Coopbank in Kenyan Premier League. 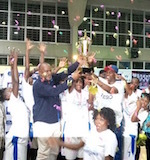 Akinyi's team won Kenyan Premier League Regular Season in 2013. She represented Kenya at the African Championships U18 in Cairo (Egypt) nine years ago. Akinyi previously for United States International University.